Each site will be auctioned separately. The starting bid for St. John's and Mary Immaculate is $13.5 million and $4.35 million, respectively. Both sites are zoned for residential and/or commercial use. The successful bidder of the properties will be able to do what they want with the properties as long as it is within zoning rules. The Newtown Historical Society, in conjunction with The Newtown Pippin Project, identified 3 locations at which to plant historic Newtown Pippin apple trees, bringing the fruit back to its place of origin. The fruit trees were planted Monday at Maspeth Federal Savings, the Middle Village 75th Street Block Association’s community garden and at Ridgewood’s Onderdonk House. The Newtown Pippin variety of apple was named after the western area of Queens, once known as Newtown Township. The original apple tree was located on the Gershom Moore farm along a tributary of Newtown Creek in the 1700s. From it, cuttings were taken and planted in orchards throughout the world. The apples were cultivated by some of our country’s founding fathers, including George Washington and Thomas Jefferson. As part of a history and environmental project, the Newtown Pippin Project is offering free Pippin trees for planting throughout the city, with added emphasis on locations in western Queens, where the Pippin once grew and was first discovered by colonial Americans. Thanks to a sponsorship from Green Apple Cleaners, care and guidance from the NYC Department of Parks and Recreation, and pioneering local orchard replenishment by Slow Food NYC, a distributed orchard is being created among the city’s open spaces. The Newtown Historical Society scouted out locations suitable for the trees and volunteers planted them in Maspeth and Middle Village on Monday, October 5th. (The staff of the Ridgewood Historical Society planted the trees at the Onderdonk House after Newtown delivered them.) The planting consists of a Newtown Pippin tree and a pollinator tree. The Onderdonk House received an Elstar apple tree as a pollinator, which is a Dutch variety. The other two locations received St. Edmund's Russet trees. "I commend Christina Wilkinson for her leadership in bringing back Maspeth's own Newtown Pippin tree," said Council Member Elizabeth Crowley. "As a member of the Environmental Protection committee, I am working with my colleagues to restore the growth of these beautiful trees through New York City and to declare the Newtown Pippin the official apple of the Big Apple!" The trees may bear their first fruits by 2011. For the next planting in Spring 2010, Newtown Historical Society will focus on bringing the trees to area schools, houses of worship and cemeteries. 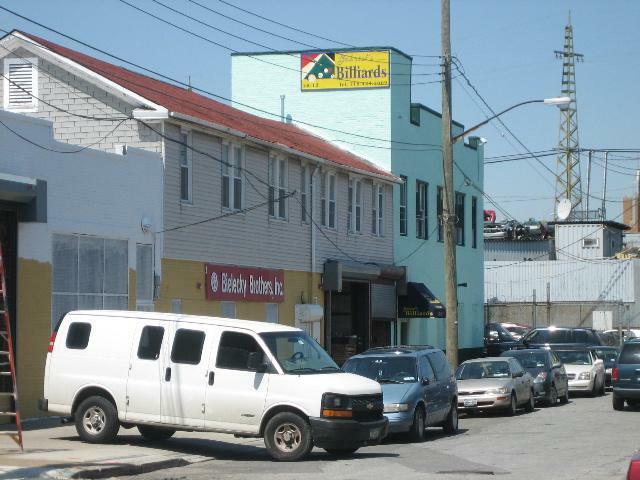 COMET extends a warm welcome to Kramer's Paint and Hardware, a family-owned and operated business located at 59-24 Grand Avenue in Maspeth. Their phone number is 718-416-2946 and their website is www.kramerspaintandhardware.com. Lucille Winsko told me that it would be okay for me to e-mail you regarding the homeless men that are living in and around the triangle behind the deli and Pioneer on Hamilton Place. She told me that someone would be installing the metal pieces to separate the benches so no one can lay down on them. I think that is a great idea and at least some action being taken. When they are installing them at that triangle park you may also want to let them know that the men move over to the Borden and Jay Avenue triangle for their afternoon naps. Both parks have become disgraceful. This morning when I was driving up the service road past the park on Hamilton, in the grass behind the bushes their were two or more men sleeping. It was hard to tell how many were there because they were covered with their sheets and blankets. I don't know why they were there. I believe they usually sleep in the greenery on the sides of the Long Island Expressway. Maybe because nothing has been done about them they aren't even going to bother moving into "hiding" at night. When I went by a little while ago the cardboard they had laid out as the base for their bedding was still in the grass. I am feeling so frustrated as this situation has now been going on for years and each week there is another man added to their group. My daughter and her friends will be starting I.S. 73 next week and my concern now is that one day one of these men will be very drunk (as they are every day) and go after her or one of the children or the elderly walking past that area. In addition, a there is a yellow bus stop for PS 153 at the corner of Hamilton and Grand where children get on and get off on a daily basis. I have instructed my daughter to stay away from that block in particular but these men are all over Maspeth pushing their shopping carts, going through everyone's garbage, entering the yards and driveways and taking more than just bottles and cans. Last year one of them entered my alleyway and took a computer that I had next to the back door. It was intended for garbage but it wasn't in the garbage and he had no right to take it. I chased and yelled at him myself but at the time I didn't realize that I should have called 911 and reported it. I'm never sure what is something to report and what is not. My son recently went for a walk and decided to sit in the park by Hamilton Place and he couldn't stay because the smell of urine and feces was overwhelming. These men wash up in the water fountain, urinate in the bushes and line up a multitude of shopping carts behind the deli and by the driveway of Pioneer. They take over the area where the bottle returns are behind Pioneer and become an intimidating presence that it is practically impossible for the customers to use the bottle return machines. I don't know the feelings of the management of Pioneer but it's a nightmare for many customers and must be costing him business. The manager of the deli on the triangle is very frustrated. When it rains they line up on the sidewalk under his awnings either sitting or laying. Again, very intimidating for the pedestrian traffic walking by. They have stolen from him numerous times but he, too, feels very intimidated by the sheer number of them. Sometimes they ask for cigarettes and money from the passersby. Soon someone is going to get hurt. There is a children's section in that triangle and very rarely do you see any mothers enjoying the area with their children. Once they get there, they see these men, and they leave. I hate that I feel that once again Maspeth is being ignored. I feel that if this were happening in Middle Village it would be taken care of immediately. I know that it is difficult for the police to take action and that social workers can only ask them if they want help and they can refuse. I do have compassion for those who become homeless and helpless but there has to be some happy medium for everyone. It is very difficult for me to complain because I do feel bad for those who are down on their luck but this situation is more than just a few men down on their luck. My friends and I have contacted Marge Markey's office numerous times in the past. Both about these men and about the rats that had taken over the area. The rats seem to be a little more in control but it's only a matter of time before the area is infested again. No action has been taken about these men. I believe some of the firemen from across the LIE have come and tried to get them to move. The only thing that happened then was that the firemen got in trouble. Please let me know your thoughts and if there is anything else I can do. I want to thank you for all that you have done and are doing. There seems to be more official attention to the situation but unfortunately nothing has really changed. The attached picture is from yesterday of the park on Jay and Borden. 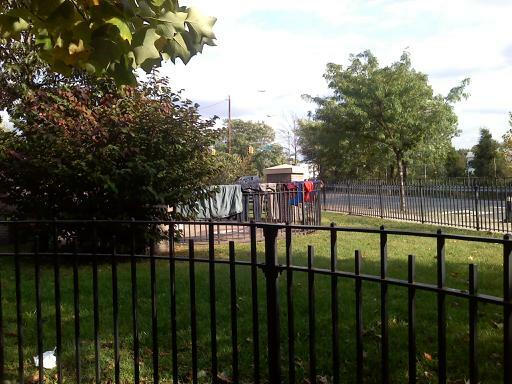 A friend's 14 year old son who lives across the street from the park took the picture because he is now upset by the situation after walking with his mother the other day and seeing the way they were looking at his mother and feeling how disturbed some of these men seem to be. There was also some clothing hanging in the park on Hamilton and Perry Ave. Complaints were called into 311. All I can do is shake my head and keep my own 12 year old daughter away from the area, which is difficult to do as she has to walk up and down Grand Ave every day since she attends I.S. 73Q. She's aware of the situation and does her best to pay attention to her surroundings but I just think this is so sad on so many levels. Once again, thanks for your help. with them. And now, I have requested that CB2 investigate two items: does their Certificate of Occupancy allow for restaurant services, and if it does, then has the appropriate agency granted them a license to operate as a restaurant services establishment.